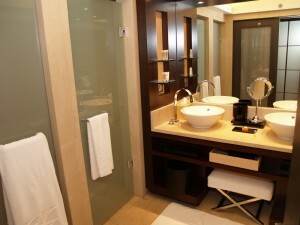 Apart from being an essential inclusion in any bathroom a mirror can offer more than a simple reflection. Mirrors are available in many shapes and sizes that will fit into the design of any bathroom and provide a feature that will complete your room. Custom made Valiant mirrors provide the most impact by transforming your bathroom into a beautiful and elegant space. In keeping with current design trends a majority of our mirrors are completely frameless, which contributes to the illusion of space in any application. The main consideration in selecting a mirror for any bathroom is to choose a mirror that fits into the theme of your overall design. A mirror should not dominate your bathroom and must blend into the surroundings to complement the room. Small mirrors may not offer the benefits that a large mirror can present, however some large mirrors can dominate and become a little overwhelming. The perfect mirror will go unnoticed but will highlight other feature and fittings, therefore enhancing the beauty of your bathroom. Contemporary interior design trends have also meant framed and bevelled edged mirrors have become less popular in recent times. Valiant’s frameless bathroom mirrors are modern and sleek and being manufactured to the highest standard to ensures you receive a quality product that adds value to your Sydney property.